Hey crafters.....Stampin' Up! 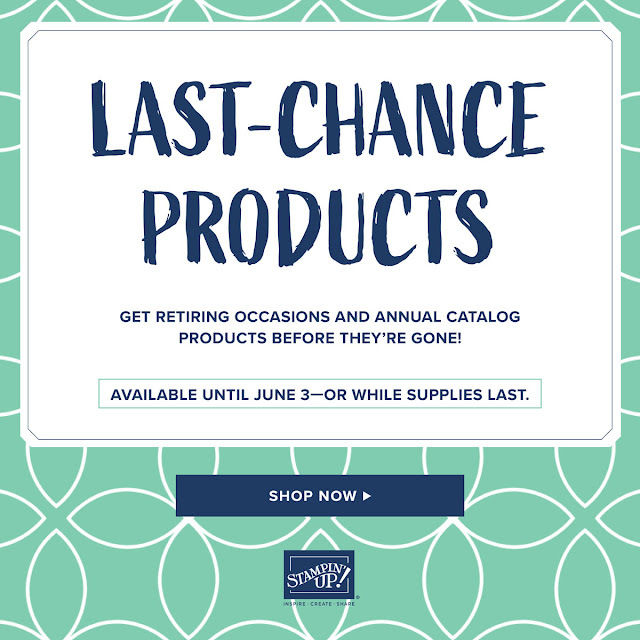 has released the anticipated retiring list from the Occasions 2019 and Annual 2018-2019 catalogs. Please be aware that due to the high demand for retiring stamps these items will have a guaranteed availability until May 24th. Everything else is NOT guaranteed and are ONLY available while supplies last. Some items sell out very quickly, especially the retiring 2017-2019 In Colors. Get your wanted items NOW!!! Stampin' Up! has said that depending on inventory levels some items may be discounted on or after May 9th, but if you really love an item I so recommend getting it now as it may not make it to the discount date. I have seen items sell out in just a couple days!!! Also if you have placed an order with me in the past 6 months I will be sending you the new 2019-2020 Annual catalog for free in May. If you would like a free catalog too just place a minimum $25 order before tax and shipping and I will send you one starting mid May. Place an order here. Hope you all have a great day and thanks for coming to my blog! Remember.....DON"T WAIT-ORDER TODAY!